Coverage: Live coverage across BBC Two, BBC Red Button, Connected TV, the BBC Sport website and mobile app. 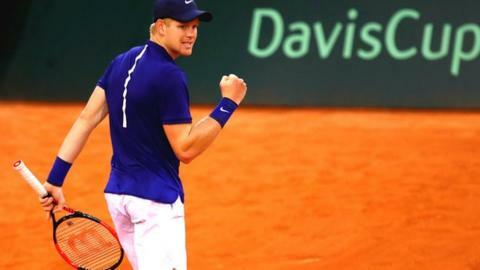 Follow live BBC TV and text coverage as Great Britain meet Spain in Marbella in the first round of the 2018 Davis Cup from 2-4 February. Britain's Kyle Edmund has been left out of the first day's play because of a minor hip problem suffered during his Australian Open semi-final defeat in Melbourne. Captain Leon Smith has instead handed Davis Cup debuts to Liam Broady and Cameron Norrie, with world number 165 Broady taking on 21-ranked Albert Ramos-Vinolas in the opening rubber on Friday. Norrie, who is ranked 114th, faces world number 23 Roberto Bautista Agut at Club de Tenis Puente Romano. Jamie Murray and Dominic Inglot are set to face to Pablo Carreno Busta and Feliciano Lopez in Saturday's doubles. Sunday's line-up will be confirmed on the day. World number one Rafael Nadal is still recovering from an injury that made him retire from the last eight of the Australian Open. The two nations have not met in the Davis Cup since 1986, when Britain won 4-1 at the same stage of the competition in Telford. Watch all the action live across BBC Two, BBC Red Button, Connected TV, the BBC Sport website and mobile app and follow text updates online. The BBC Sport website is available via desktop, mobile, tablet and app, giving fast and easy access to the live stream, text commentaries, news, reports, schedules and videos, as well as highlights of the day's action. The BBC Sport app is available free on Apple and Android devices. Read more on Grand Slam winner? Top 10? What's next for Kyle Edmund?